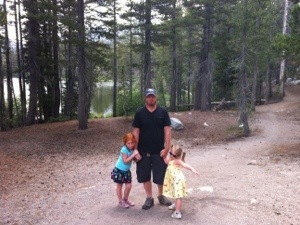 While I love a visit to Mammoth Lakes in the winter, a summer vacation there — especially with kids — just keeps getting better. This year, we visited at the beginning of August. It was an impromptu vacation to escape the L.A. heat and also get away before the early start of school (not a fan of the new L.A. school schedule). After the typical five-hour drive, we checked in at the Westin Monache in Mammoth Lakes, which we love. They are very family-friendly, all the rooms have kitchenettes and our one-bedroom suite had a balcony with a view of the pool. Of course, that was the first place we were headed once the girls woke up in the morning. And, although mom and dad wished there was poolside dining in the a.m., everything else was awesome. The girls made friends and were there for a couple of hours. The next stop was the biggest hit of the weekend. 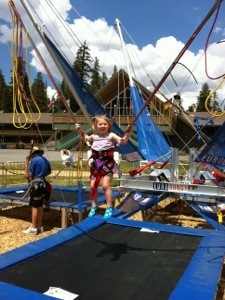 Mammoth Mountain’s Adventure Kids center. For $29, kids can get an all-day pass for climbing walls, a zipline, gondola rides, the euro bungy, which teaches them to jump and do flips while in a harness on a trampoline, and discounts on mountain biking. Our daughters are young, ages 3 and 5, but loved every minute of it. The only thing they didn’t partake of was the mountain biking but, even the littlest one went on the zipline and it was amazing to see her climb that tall ladder. As the end of the afternoon approached, we felt sure that the thunderstorm that had been threatening to roll in all day would finally let loose, but instead, we had snacks at the newly renovated Yodler and then headed up the gondola for a walk at the top of the mountain. Not a single drop fell — and I was a little disappointed. The next day, we headed to Lake Mary. A recently constructed series of paved bike trails now runs all around the lakes up there, and had we known, we’d have brought ours. If you do forget, like we did, there are rentals available. We preferred a hike around the lake instead and have decided that, next time, we are going to stay up there in one of the cabins — maybe do some finishing, bike and take a horseback ride. If only we had had more time.